As Bernie Sanders is peaking in the Democratic Nomination process many pundits claim it is too late for him to be the nominee of the Democratic Party in terms of delegates. While holding a large delegate lead, Hillary Clinton will arrive in Philadelphia an injured candidate. Mysteriously changing voter registrations in caucuses and closed primaries shade the wins she has achieved. FBI investigations into her email servers and clamoring about her quid pro quos to Goldman Sachs drag her credibility into the mud. The fact Barack Obama beat her about the head with her Iraq War Vote in 2008 is the perfect game plan for the GOP to employ in 2016. There are just too many negatives on the Clinton side that will allow the GOP to destroy her in the general election. In a dangerous game of rock, paper, scissors each remaining candidate beats only one of their opponents and loses to the other. Bernie beats Donald Trump in a general. Hillary beats Bernie in a smaller Democratic Primary. Donald Trump beats Hillary in a General. To those who say that Sanders has not been vetted properly because the word “Socialist” has been banned in many lexicons, keep something in mind; FDR ran on essentially the same agenda. The Constitution was changed after he died in office during his 4th term. This country has always been ready for someone who will use fairness or honesty as a conduit to power. Kennedy, Carter, Reagan, Clinton, and Obama all were outsiders when running for their first terms. All were knocked on the lack of foreign policy experience as some sort of minus. Sanders is no different. But this campaign cycle is. The Democratic Party has sold its soul to Wall Street, Insurance, Fracking and the host of lobbyists who make up the Clinton Wall of Super Delegates. They block Sanders’ arrival to the White House. In August, after the Democratic Party nomination is the Green Party nomination in Houston. There is an outlet for the millions of disaffected Democrats and Independents. The question is would Jill Stein, the perennial leader of The Green Party, open the party’s door to these millions and their energies. Want to talk about the Art of the Deal? The Greens have and small car without a top-flight driver. Bernie has proven to be a skillful driver soon to be without a car. The Greens would gain numbers and credibility instantly. In the 2012 cycle the Green Party garnered less than 500,000 votes. If the Green party cuts a deal to increase its footprint by putting a new voter threshold for Sanders at 3 million, it would drive the Democrats up the wall, as the number of votes Ralph Nader received in 2000 was about 2.8 million. Bernie does not even have to respond to the offer publicly. Walking out of a crucible of the Democratic Convention that has been rigged against him, interest in such a campaign would be compelling. Imagine the close of the Democratic Convention in Philadelphia where protests by those yearning for Sanders are beaten back by police state tactics. If Debbie Wasserman Schultz was worried about what happened in Vegas staying in Vegas there is a real possibility she may push the local security forces in Philly to go overboard in quashing dissent. The ham-handedness of everything Democratic this year could easily sway 3 million of the disaffected to swap parties in a week. Just in time for Houston. A Green Party convention concluding with Sanders’ Army marching onto the field would easily eclipse the 15% threshold required by the Presidential Debate Commission to put him on a debate stage to duke it out on an even playing field against both Clinton and Trump. 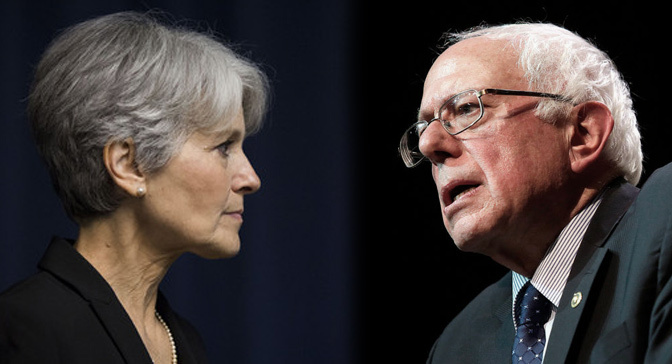 By making the offer now, as Democratic primaries hang in the balance, the Green Party would be making a bold move to disrupt the 2 party system they abhor. The Green Party throws the perfect monkey wrench into the system and creates an escape hatch for Democrats wanting something better than their party has become.